Implants from Devin Dickinson, DDS are an aesthetic, functional, and stable option to replace missing teeth. 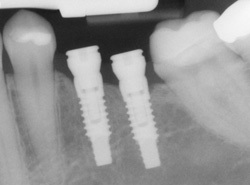 They are made of two parts: the implant (root) and restoration (crown). 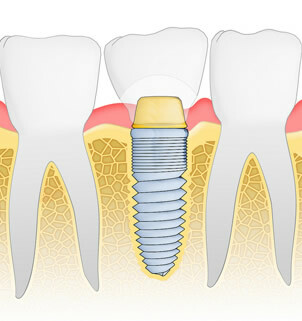 The implant is made of titanium, and the crown is made of porcelain to blend in with the rest of your natural teeth. 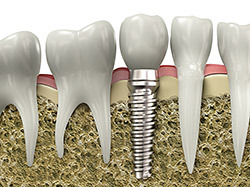 Implants are fixed (non-removable) and provide a long lasting, convenient treatment option. They are easier to eat with and clean than a traditional restoration appliance, like a bridge or partial denture. Aesthetically, they look and feel like regular teeth. Compared to a bridge, an implant requires no modification of the adjacent teeth, providing a conservative treatment option and maintaining as much healthy tooth structure as possible. Dr. Dickinson performs full and partial 3D computer-guided implant placement right here in our Arlington, WA dental office. This allows for a more efficient and conservative surgical procedure. With the aid of the guide, Dr. Dickinson can place the implant exactly as planned, as opposed to a free-hand implant placement. Implants are easy to maintain with regular brushing and flossing. Regular visits for professional teeth cleaning at our Arlington, WA dental office are necessary to keep your implant—and the rest of your natural teeth—as healthy as possible.